Breakdown: In only its fourth year, the Adrenaline Sports Management (ASM) Santa Hustle 5K has already expanded to seven locations across the country, with Chicago’s being the first and largest of the season with around 8,000 runners this year. And almost all of them listened to their inner holiday spirit and donned the Santa shirt, hat and beard included in the goodie bag on race day, leading to a red sea of Santas of all shapes and sizes. Christmas music blared at base camp and along the course, and a vast spread of cookies and milk was available after the race. Having runners group themselves by pace seemed to work well and kept the course open, even for the trip back along the Lakefront Trail. Whether you’re a runner or not (ASM says about eighty-five percent of participants this year do not consider themselves “runners”), this well-organized, family-friendly fun run is a perfect way to start December in a very merry mood. Course: Starts and finishes just south of Soldier Field. A waved start kept the Lakefront Trail from getting too crowded, though there were still a few bikers to dodge along the way. Along with water, cookies, milk and M&Ms were available at the various support stations along the route (tasty, but not recommended if speed is your goal). Organization (gear check, etc. ): Perhaps making a subtle dig at the lengthy packet pickup times for Hot Chocolate this year, the race announcer proudly declared that Fleet Feet handled pickups well and that the “longest anyone waited was three minutes.” I don’t even think I waited that long. Gear check was also a breeze. Goodie Bag (includes shirt): The long-sleeve red athletic shirt is clever, even if the Santa design makes it a bit of a one-time wear. 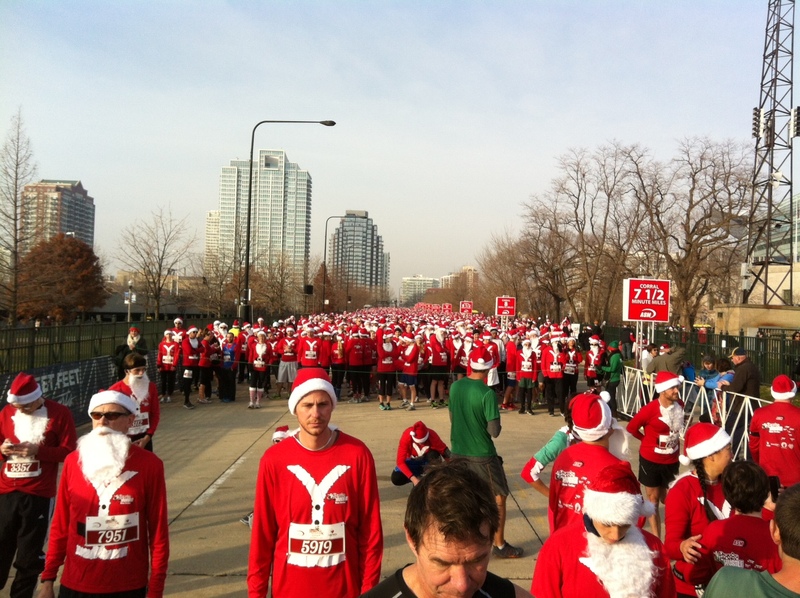 Runners also got a Santa hat and beard.